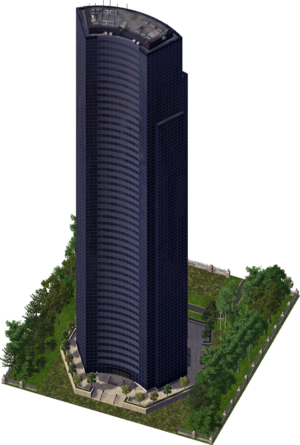 Columbia Seafirst Center is a Landmark Building in SimCity 4. It is a recreation of Columbia Center in Seattle, Washington, United States of America, completed in 2005. The name of the building in real life does not match that of the game as the building was renamed from Columbia Seafirst Center to Bank of America Tower in 1983 when Seafirst was absorbed into Bank of America, then to Columbia Center when Bank of America greatly reduced the size of their tenancy in 2005. Maxis probably didn't use the building's actual name from the time to reduce confusion between it and the Bank of America landmark. This page was last modified on 5 February 2014, at 23:38.